Marian F. Grant was born in northern Illinois in 1925. In 1944, at the height of World War II, Marian married her college sweetheart, Mel, who was a captain in the Air Force. Marian and Mel ended up being happily married for 72 years. At that time, they also moved to San Diego, which became their permanent home. They started their family there, bringing two girls and a boy into their lives. Marian studied English, Poetry, and all forms of art. 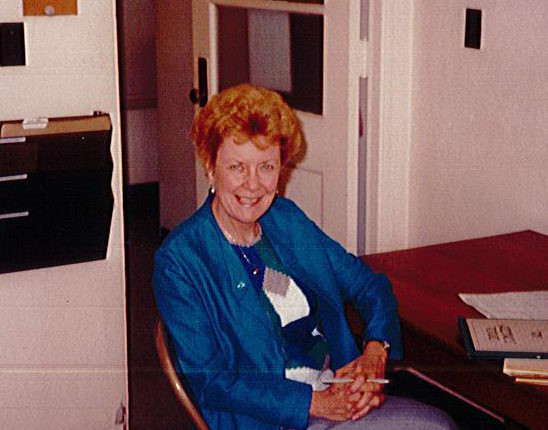 She especially loved teaching, which brought her to Aseltine School from 1977 to 1987, where she spent ten years as Executive Director and several years on the Board of Directors. After formally retiring, she shifted her efforts into bringing her love and pursuit of The Arts to the students of Aseltine. She also remained involved with the school in other ways, volunteering in many capacities and serving as a lifetime member of the Angels of Aseltine Auxiliary. The 40 years that she spent teaching were gratifying, especially supporting the students with special needs. She was honored in 1993 for her strength, determination, and dedication to carrying Aseltine School through its most difficult times. Now at 95, Marian still teaches classes and enjoys doing art projects with her grandchildren.